Blooming Where Planted: This is how we do it. It's been a quiet day. Pretty much just Jacob and I. Unfortunately, that was because Chris and Sam got grounded. Eric went up to Marion to help Grandpa Willman move out of his apartment. He came home with a bunch of stuff that I don't know what to do with. In the mean time, I got to have a quiet day with my sweetbaby. He keeps me busy, so I wouldn't say it was Relaxing, but it was Quiet, for the most part just Jake and I, and occasionally (mostly when Jake was sleeping) having to break up the big boys. But this is How we sleep. I keep talking about how I sleep with Jacob every day and night. It was a burden for a while. But really, it's not so bad. He does pretty well, when we're together. When I touch him, or he reaches for me in the middle of the night, if he's upset, he calms down. He's my snuggle bug. And I'm ok with that. He is also not a fan of having his picture taken when he's sleepy. Still, I am there to calm him. I guess I'm adjusting to having him with me all the time. It's not so bad waking up to this sweet face, nope, not too bad at all. When Daddy came home, Jacob went for him, and he got rather fussy when Eric didn't pick him up right away. 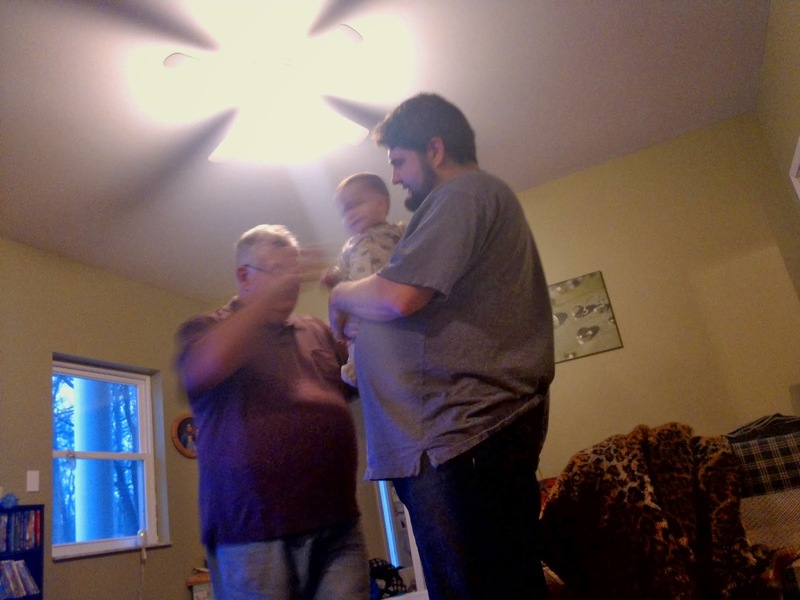 Jacob even let Grandpa hold him for a moment without melting down... It was only a moment, because by the time I got the camera, the moment was gone. But Grandpa was having some fun tickling him. He didn't let Grandma hold him much, but we all had some fun watching Jacob scooterbug around the floor. He's getting quite speedy now. Mom and Dad picked up BW3s wings for dinner, and we had a little party. This seemed to put everybody in a better mood. Even the big boys. So this is how we do a quiet Saturday, snuggling, sleeping, spending time with Fam. Not exactly what I had planned, but still a good day.